Israeli directors announce they too will boycott the new cultural center in Ariel. Dozens of Israeli movie and TV directors have joined the boycott of the theater in Ariel, it was reported on Sunday. The boycott was first announced several months ago by Israeli theater artists and academics who refused to perform in Ariel simply because of its location in Samaria. The artists and actors wrote in a letter to the national management of theaters in Israel that no performances should be held in Judea and Samaria. Performing in places such as Ariel, they claimed, was "against their consciences." The directors who have joined the boycott claim that they are not necessarily motivated by the ideology of refusing to perform in Judea and Samaria, but by the issue of freedom of speech. This is evident from an online petition signed by the directors, which reads: "Together with you we will stand up for our civil rights and moral duty to express our opinion and to act according to our political positions and our conscience, and therefore to try and influence the future of the State of Israel." Another possible reason could be a proposal made last week by Culture Minister Limor Livnat, who suggested requiring state-supported Israeli theater companies to require actors to agree to perform in any Israeli venue in order to retain their government funding. 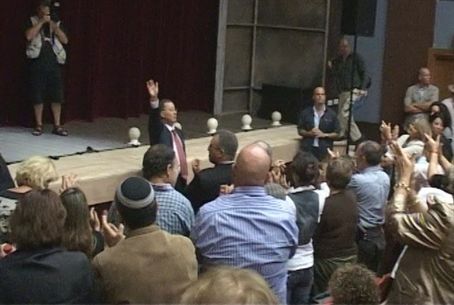 Despite the boycott, the theater officially opened last week with hundreds of Ariel's residents in attendance. On opening night, the Be’er Sheva Theatre group performed the play “Piaf,” about the life of the French chanteuse Edith Piaf.